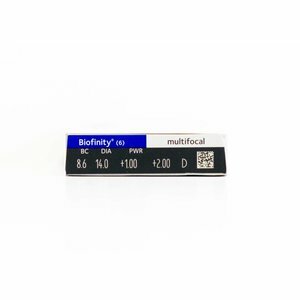 Biofinity Multifocal - 6 lenses - Weblens - Your Contactlenses Online ! The known quality of CooperVision. A Silicone Hydrogel soft contact lens from the Biofinity family that provides a sharp view far and near. Because of its advantage in technology, this lens is truly the cream of the crop on a multifocal level. Why, if you have already passed the 40, would you let your pace slow down by reading glasses? Multifocal Biofinity contact lenses offer a sharp view and many advantages. Multifocal lenses - to be replaced monthly - to be maintained with an all-in-one liquid or peroxide system.